In this lesson, we shall learn how to write code for the checkbox. The Checkbox allows the user to select one or more items by checking the checkbox or checkboxes concerned. 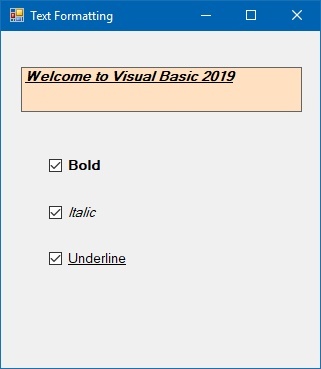 For example, in the Font dialog box of any Microsoft Text editor like FrontPage, there are many checkboxes under the Effects section. The user can choose to underline, subscript, small caps, superscript, blink and etc. 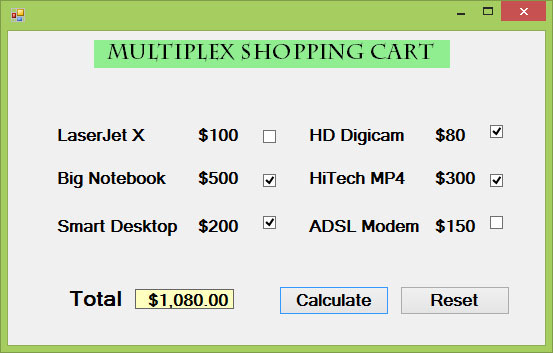 In Visual Basic 2019, you can create a shopping cart where the user can click on checkboxes that correspond to the items they intend to buy, and the total payment can be computed at the same time. In this example, we add a few labels, two buttons, and six checkboxes. We declare the price of each item using the Const keyword. If a checkbox is being ticked, its state is True else its state is False. To calculate the total amount of purchase, we use the mathematical operator +=. For example, sum+=BN is actually sum=sum+BN. Finally, we use the ToString is a Visual Basic 2019 method to display the amount in currency. In this example, the text on the label can be formatting using the three checkboxes that represent bold, italic and underline. will retain the original font type but change it to italic font style.